On auction will be a rear plate TT 378-20 as fitted to James Bond's Aston Martin DBS in the 2006 film Casino Royale. This is a Serbia and Montenegro rear plate, in acrylic with black lettering on white ground and featuring the Aston Martin logo, as fitted to one of the Aston Martin DBS V12 cars driven by 007, played by actor Daniel Craig, and featuring in several scenes in the film, 55cm wide, mounted to a presentation display stand. The Aston Martin DBS V12 cars used in the film Casino Royale were specially modified versions of the Aston Martin DB9, as the DBS V12 was not officially unveiled until the 2007 Pebble Beach Concours d’Elegance. 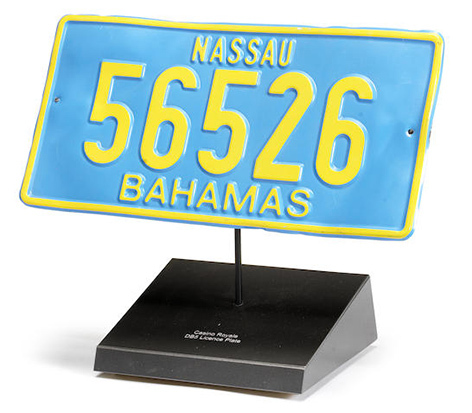 A Nassau Bahamas license plate 56526 as fitted to James Bond's Aston Martin DB5 in the 2006 film Casino Royale, pressed tin plate with yellow lettering on blue ground, one of two plates fitted to the left-hand drive DB5 won by 007, played by actor Daniel Craig, in the poker game from Alex Dimitrios at the One & Only Ocean Club, and appearing in several scenes in the film, measuring 30cm wide and with some soft dents and bends, mounted on a presentation display stand. Although an earlier model, this green Aston Martin V8 Vantage Volante looks very similar to the V8 Vantage driven by Bond in The Living Daylights (1987). 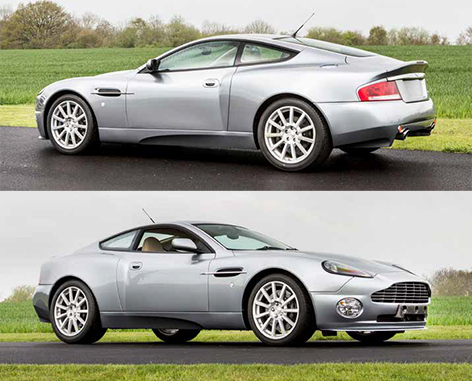 The 2007 S is an updated model from the Vanquish used by Bond in the 2002 film Die Another Day. 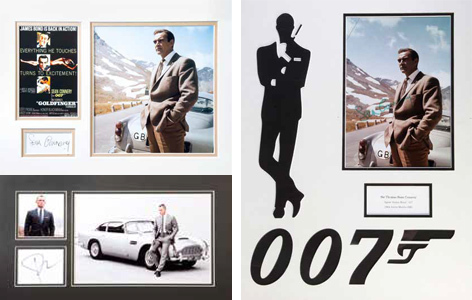 Other Bond related items include signed photos of Aston Martin DB10, DB5 and Daniel Craig, and a 1:8 scale Aston Martin DB5 model. 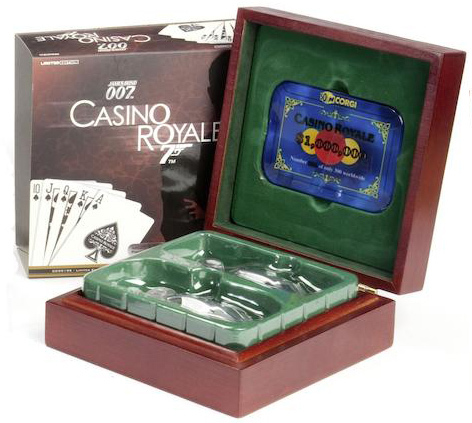 Another interesting piece is this rare Corgi James Bond Casino Royale ‘first shot’ limited edition gift set, numbered 83/300, Corgi number CC99195, comprising 1:36 scale models of DB5 and DBS, each signed by the model maker, unpainted bare metal pre-production ‘first shot’ castings, in wooden display case fitted with a $1,000,000 casino chip as certificate, with card outer display sleeve. The Bonhams Aston Martin Sale auction auction takes place on Saturday 13 May 2017 at Aston Martin Works, Newport Pagnell (the location of the original Aston Martin factory) in the UK. There are many other interesting lots in all price ranges for Aston Martin and James Bond enthusiasts, so check out the full auction catalog on Bonhams.com.